Ahead of the holidays one can get 50 GB of Internet and “Y” tariff plan for 30 days when buying a number of smartphone models by “Samsung”, “iPhone”, “Honor”, “Xiaomi” and other brands, Vicacell MTS reported. 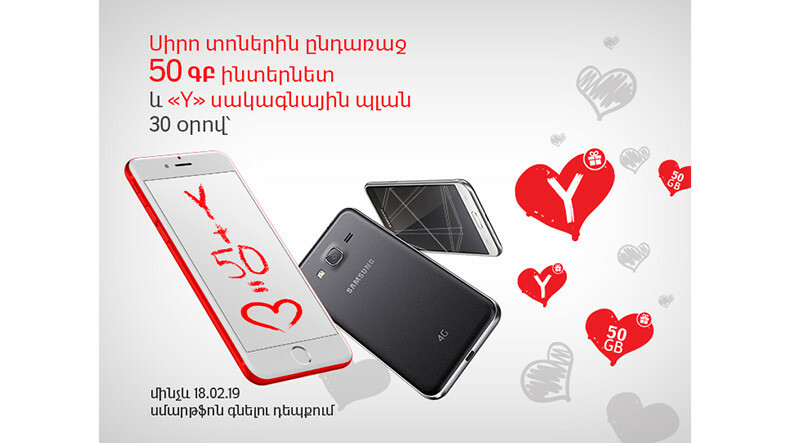 The offer is valid till February 18, 2019, (inclusively).Here one can get acquainted with the smartphone models within the offer. The devices can be purchased both in cash and by installment. What services are provided by “Y” tariff plan? To check the balance of the 50 GB internet-package, please send *440# command. • In case there is AMD 2800 on the subscriber’s account on the day of expiration of the “Y” tariff plan 30-day validity period, the sum is charged, and the tariff plan is automatically prolonged for 30 days. • The subscriber first consumes the 50 GB Internet package provided within the offer, then the 5 GB Internet-package provided by “Y” tariff plan. After consumption of the 5 GB internet package during the 30-day validity period of “Y” tariff plan, a 500-MB additional daily package is automatically activated upon the availability of at least AMD 100 on the account balance.